June 27, 2013 by Verle L. Bell, M.D. The Bible is without error, and it says of itself,that it is profitable for practical truth to guide, reprove, fix, purify and equip you for ministry and every life challange. So why don’t I run to it practically on a daily basis to see what is says about my current life problems? So where do I begin to search the scriptures? First I write out what I want to know about the concern about the current life issue. Next I admit I lack wisdom, (that’s easy) James 1:5, brace myself to listen to truth I definitely will not like, and agree to agree with God no matter what he says. Example: what does God say about spanking children? Next, I think of any words that might be related to the question. In this case: discipline, admonishing, spanking, scourging, chastening, and punishment pop into mind. Next I think of any stories in the bible that fit the question. Now I’m off to a good start. It is important to gather an overview of the subject before drawing conclusions. 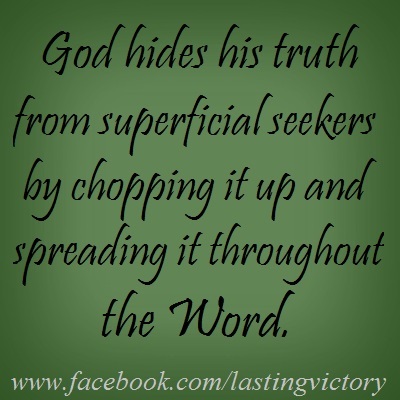 God hides his truth from superficial seekers by chopping it up and spreading it throughout the Word. He is very balanced and I must gather all the parts before I look at the overall picture. SPANKING : no verses, oh well! it is good to write out all the words we can think of and check. Remember we must dig for everlasting truth just as a gold miner digs for gold that perishes. SCOURGE, nothing, yes but look around nearby and you will find scourgeth with Hebrews 12.6 which applies. CHASTENING, there are 10 references, but look around, chasten has 6 chastenest 1 , chasteneth 5, chastisement 5,chastened 8 and chasten 6. PUNISH This word, as you study will clearly not apply to raising children. 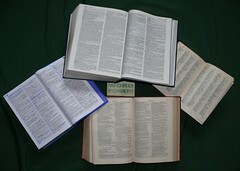 Next I use a cross reference Bible which suggests verses that expand on the topic. There I find that God turns fathers’ hearts to the children and that a father is to raise his children in the nurture and guidance of the Lord and the Word and not to stir them up to rage. Next I think of pertinent Bible stories that apply, such as what happened to Eli and his boys when he didn’t discipline them. King David’s children when they were not properly parented. Now I review all the pieces and pull together a balanced report of what God says, I keep a humble, open mind aware that he will continue to reveal more and more from his infinite word as I grow and mature in life. Remember, HE IS and he is the rewarder of them that diligently seek him. These thoughts are part of how I try to diligently seek him. LORD HELP ME TO GO TO YOUR WORD AND REMEMBER THAT THERE WAYS THAT SEEM RIGHT BUT LEAD TO DEATH, AND THEN THERE ARE YOUR WAYS SPELLED OUT IN YOUR WORD THAT LEAD TO LIFE IN THE PRESENT AND FOREVER. This entry was posted in Uncategorized and tagged Bible, Bible Study, Child discipline, God, HOW TO: outlines on godly living, Relationships. Bookmark the permalink. How do you help parents that do not know how to discipline their children or else do not want to cause of a divorce or that it is too hard and its a lot easier to just let the child do whatever so that you do not have to listen to them complain and argue? I have several parents that have given me every excuses out there as to why they let their child get away with such disrespect to their mothers and fathers…… I remember that this was the same problem Eli had, he got tired of always dealing with them, to the point he just gave up pretty much. but how do you encourage parents to keep disciplining their children when they know the truth but somehow seem to refrain from putting what they know into action? In one case i am the only one that puts any limits on an 11 year old and it is really rough on me, but the child is just as bad to the parents if not worse and I hate the way there is no respect of elders in this child. You are familiar with the APPEAL, as a way of talking to someone who has trouble seeing that their way is not the best. You could also try asking them questions, rather that criticizing or telling them to shape up. “What are your goals for your son? Are you comfortable with his current progress? Is there anyway that I could help? Until the parent says that they are frustrated but don’t know what to do, your advice or concern is likely to fall on deaf ears. I know you want your son to be happy and develop his abilities and personality. This is important to you because you love him and your own happiness and reputation are involved. I appreciate how much time and effort you have put into helping your son and providing for him. I care about him and want to see him do well, and have invested in his life as well. My concern is that when he uses foul language with adults, refuses to listen or to help, slams doors etc. he is developing traits that will destroy his chances in education, marriage, jobs etc. God himself wants to help your son and if the current limits don’t work then God will have to look for bigger and more painful chisels to use to shape his life. I suggest that a few simple rules be established and a few chores be delegated, then that all food be locked up in the house and all money be taken away. They if he does the chores and says one sentence of gratitude to you his parent. then and only then should he eat. Thessalonians points out no work no food. I would be willing to help by buying a chain for the refrigerator. What do you think of my concerns and do you have any better ideas? I counseled a single mom with a tall rebellious 13 year old son who refused to help around the house. As a result she locked the fridge and put all the dry goods in a locked box and cooked his favorite meal. When he came home she said “son you don’t have to do anything around here unless you want to eat, but if you want to eat you must take out the garbage and make your bed. If you break into the box and help yourself, then I will call the police. He then called his grandma who said she was with mom and he should do his chores. He then threatened to call child protective services. “over my dead body, she replied, I will explain to them your attitudes and they will back me up” He then stormed out of the house walked around the block then took out the garbage and made his bed and ate supper. FOR HE WHOM A FATHER LOVES HE CHASTENS. I LOVE this, very helpful! Thank you, I have lots of questions!